No two people are the same and there should be no two interior rooms the same. It is my responsibility as a designer to interpret my clients personal style and life view and create a unique, comfortable place for them, a space that reflects where they have been, what books they have read, what artifacts they have collected, what colors make them happy. 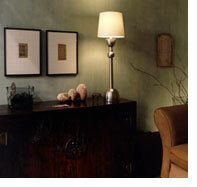 My design is anchored in the belief that aesthetics and function are equally important. I start with my clients comfort, the function of the space and then move onto space planning, color selection, lighting, fabrics, art and furniture. It is important to work within my clients budget and time frame. I help my clients design a plan that can be implemented over time to create a unified vision. 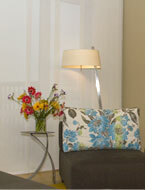 One well designed room in a house can be as fulfilling as achieving a completely finished home. Please click on any photo at right to see an enlargement. East/West Style -- Contradictions can mesh so beautifully. Combining the sensibilities of the East and West, I strive to create a sense of tranquility, harmony and simple elegance, using subtle texture, clean lines, and the colors of nature. 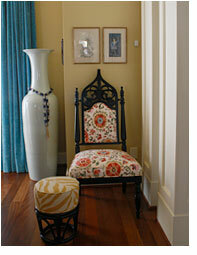 Traditional Style -- History and a sense of family is what makes this style so appealing. 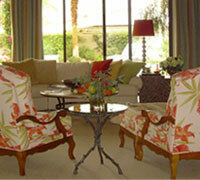 I relish working with beautiful brocades, silk, damask, Toile, and 18th Century French, English and American furniture. 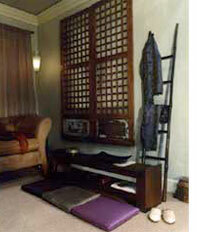 Traditional furnishings never need to be replaced or updated. Contemporary Style -- Edgy, spare and current. This style is a perfect backdrop for large scale original art. Order reigns, everything has its place. This space is "cool" and "in charge". .its quirky, unexpected and clever. That is why we like it. 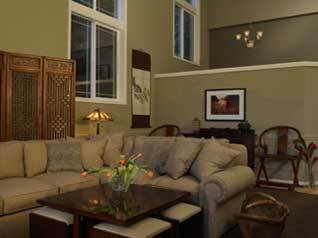 There are so many other wonderful interior design styles. I have always wanted a Swedish design project to work with soft blues and cream colors, crisp stripe cottons and simple, fine lined furniture. Is there anyone out there whos game? Mexican, Tropical, Early American, kitsch, Retro, Western....? I received my Bachelor of Arts degree from WWSU. I studied Fine Art and Design at Cornish Institute of Art, and French Impressionism at the Sorbonne in Paris. I have traveled extensively around the world and lived in Central America. 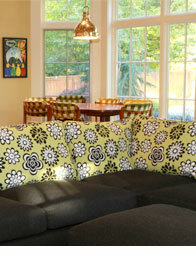 I have been the principal of my own design firm for 14 years and am located in the Seattle Design Center. My rates are $100.00 per hour. Flat fees can be negotiated on appropriate projects. Travel time is charged outside the greater Seattle area. Please call 206-860-8692 or email me.